A 2-in-1 PC, also known as a 2-in-1 tablet, 2-in-1 laptop, 2-in-1 detachable, laplet, tabtop, laptop tablet, or simply 2-in-1, is a portable computer that has features of both tablets and laptops. Before the emergence of 2-in-1s and their denomination as such, technology journalists used the words convertible and hybrid to denominate pre-2-in-1 portable computers: Convertible typically denominated those that featured a mechanism to conceal the physical keyboard by sliding or rotating it behind the chassis, and hybrid those that featured a hot-pluggable, complementary, physical keyboard. Both pre-2-in-1 convertibles and hybrids were crossover devices that combined features of both tablets and laptops. The later 2-in-1 PCs comprise a category that is a sibling to both the pre-2-in-1 convertibles and hybrids. Models of 2-in-1 PC were each similarly denominated either a 2-in-1 convertible or 2-in-1 detachable, respectively, and despite borrowing the terminology of the pre-2-in-1 PCs, the two species of 2-in-1 PCs are distinct from the two species of pre-2-in-1 PCs because 2-in-1 PCs have additional features of traditional laptops. 2-in-1 PCs consist of portable computer components within light and thin chassis, and exemplify technological convergence. They are convenient for media consumption and non-intensive tasks in tablet mode yet useful for content production in laptop mode. 2-in-1 convertibles are tablets with the ability to rotate, fold, or slide the keyboard behind the display. On most devices, the hinge is situated at the display and keyboard junction. However, the Dell XPS Duo is unique in that the display sits in a frame that allows the screen to be spun. 2-in-1 detachables are devices with detachable keyboards. In most cases, the keyboard part provides few, if any, additional features (most often a touchpad, as in the HP Spectre x2). However, the keyboards of some detachables provide additional features similar to those of a docking station such as additional I/O-ports and supplementary batteries. For instance, the Surface Book can leverage the discrete GPU in the keyboard upon the keyboard's connection. When connected to the keyboard, the display of the detachable can either be free-standing on the hinge or require external support, often in the form of a kickstand. Novel ways of providing external support include the bending frame and locking mechanism of the HP Spectre x2. Though the keyboard is usually bundled with the purchase of a 2-in-1 detachable, it is occasionally deemed an optional accessory by manufacturers in order to minimize the starting price of a device. In such cases the 2-in-1 detachable is often displayed with its complementary keyboard in advertisements and promotional materials. This is true for all devices of the Surface and Surface Pro lines. 2-in-1s fall in the category of hybrid or convertible tablets but are distinct in that they run a full-featured desktop operating system and have I/O ports typically found on laptops, such as USB and DisplayPort. The most prominent element is the keyboard that allows the 2-in-1 to provide the ergonomic typing experience of a laptop. While 2-in-1s fall in a category distinct from laptops, they loosely parallel the traits of the Ultrabook device category, having light and thin chassis, power-efficient CPUs, and long battery lives. They are distinguished from traditional Ultrabooks by the inclusion of a touchscreen display and a concealable or detachable keyboard. The Compaq Concerto, one of the earliest examples of a 2-in-1 PC. The earliest device that can be considered a 2-in-1 detachable is the Compaq Concerto from 1993. It came preinstalled with Windows 3.1 and Windows for PEN, and had a cabled detachable keyboard, and battery powered stylus. Mainstream attention for 2-in-1 PCs was not achieved until nearly two decades later, when many manufactures showed devices, at that time referred to as "hybrid" devices, at CES 2011. 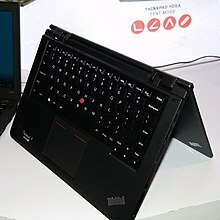 While Packard Bell, Acer and HP all had Microsoft Windows based 2-in-1s by 2011, Lenovo released the first well reviewed Windows 2-in-1: The X220t variant of the ThinkPad X220. The 13-inch device included a digital stylus housed within the chasis, somewhat ruggedized construction, and a multi-touch screen with a twist and fold hinge. Microsoft started its own line of 2-in-1s with the introduction of the Surface Pro series, the first of which was released in February 2013. It had a 10.6-inch (27 cm) display, Intel Core i5 CPU, and included the Pro Pen stylus and a detachable keyboard that doubled as a protective screen cover. In 2015 Microsoft introduced the Surface Book series, which, similar to the Surface Pro series, features a detachable keyboard cover and Surface Pen stylus. Samsung entered the 2-in-1 PC market with the release of the Windows-based Samsung Galaxy TabPro S, which was released in March 2016. It had a 12-inch display, Intel Core m3 CPU, a first-party keyboard attachment, and a TabPro Pen. Its successor, the Galaxy Book, was released in February 2017. Coming in a 10.6-inch model and a 12-inch model, the Galaxy Book has an improved detachable keyboard and include an S Pen. Google entered the 2-in-1 market after it announced the Pixel Slate in October 2018. It runs on Chrome OS and features a 12.3-inch display. It includes two USB-C ports, but it omits the headphone jack. The featured Pixel Keyboard and Pixelbook Pen are sold separately. Since 2012, a number of other prominent laptop manufacturers, such as Dell, Asus, and Sony have also begun releasing their own 2-in-1s. While the iPad Pro has optional Smart Keyboard and Apple Pencil accessories, Apple has yet to release a true 2-in-1 PC with a full desktop OS, citing the quote below. 2-in-1s are natively supported by the Windows 8, 8.1 and 10, and Chrome OS operating systems. Various other Linux distributions also support some touch features of 2-in-1s, though they are generally unsupported by hardware vendors. ^ "2 in 1 Detachable Laptop Tablet Hybrid PCs | HP® Official Site". www8.hp.com. Retrieved 2016-04-17. ^ a b c Chang, Alexandra (17 October 2012). "Here Come the Hybrid 'Laplets.' Should You Care?". Wired. Retrieved 5 September 2014. ^ "Microsoft Surface Pro 3 Teardown". IFixit.com. Retrieved 5 January 2015. ^ Ardjuna Seghers (3 April 2013). "Dell XPS Duo 12 review". Trrusted Reviews. Retrieved 7 September 2016. ^ Dana Wollman (7 October 2015). "The HP Spectre x2 is like the Surface Pro, but cheaper and lower-specced". Engadget. Retrieved 7 September 2016. ^ Stephanie Mlot (11 March 2014). "Pre-Order Surface Power Cover for 70 Percent Battery Boost". PCMag. Retrieved 7 September 2016. ^ Brett Howse (10 November 2015). "The Microsoft Surface Book Review, GPU Gaming Performance". AnandTech. Retrieved 7 September 2016. ^ Michael Brown (30 April 2014). "Toshiba Portege Z10t review: The best detachable so far (if you're into that sort of thing)". PCWorld. Retrieved 7 September 2016. ^ Brad Bourque (22 March 2016). "Dell Latitude 12 7000 Series 2-in-1 review". Digital Trends. Retrieved 7 September 2016. ^ Tim Danton (15 May 2012). "Microsoft Surface RT review". IT PRO. Retrieved 7 September 2016. ^ "SW5-012-14KH - Laptops - Tech Specs & Reviews". Acer. Retrieved 8 September 2016. ^ "Latitude 13 7000 Series 2-in-1 Detachable Laptop - Dell". Dell. Retrieved 8 September 2016. ^ "Helix Tablet With Keyboard - Laptop Tablet Hybrid - Lenovo US". Lenovo. Retrieved 8 September 2016. ^ Brian Westover (22 May 2014). "Microsoft Surface Pro Type Cover Review & Rating". PCMag. Retrieved 9 September 2016. ^ "Surface Pro 2 - The Microsoft Tablet That's Got It All". Microsoft. Retrieved 7 September 2016. ^ "Surface Pro 3 Talet - The Tablet That Can Replace Your Laptop". Microsoft. Retrieved 7 September 2016. ^ Devindra Hardawar (21 October 2015). "Surface Pro 4 review: Yes, it can really replace your laptop". Engadget. Retrieved 7 September 2016. ^ Clunn, Nick. "Laptop vs. 2-in-1: Which is better?". PowerMore.Dell.com. Retrieved 7 October 2015. ^ Wood, Chris (24 November 2014). "2014 Windows 2-in-1 Comparison Guide". GizMag.com. Retrieved 7 October 2015. ^ "It's a tablet! It's a laptop! It's a laplet! It's a tabtop!". Tech Radar. Retrieved 5 September 2014. ^ Andrei Girbea (2 February 2016). "What exactly is an ultrabook in 2016 – a detailed definition". UltrabookReview.com. Retrieved 7 September 2016. ^ "Compaq Concerto 2840A - Computing History". www.computinghistory.org.uk. Retrieved 2018-01-25. ^ "Growing the Surface Family: Surface Windows 8 Pro Availability Confirmed". Microsoft. Retrieved 5 September 2014. ^ Sean Hollister (5 January 2016). "Samsung Galaxy TabPro S Release Date, Price and Specs - CNET". CNET. CBS Interactive. ^ "Samsung Galaxy Book has its sights set on the Microsoft Surface". ^ Lori Grunin, Alina Bradford (9 October 2018). "Pixel 3, Google Home Hub and Pixel Slate: Everything Google just announced". CNET. CBS Interactive. ^ Peckham, Matt (26 April 2012). "Is Apple CEO Tim Cook Right? Are Laptop-Tablet Hybrids Dead in the Water?". TechLand.Time.com. Retrieved 12 August 2015. ^ Nick Peers (July 2013). "Install Linux on your x86 tablet: 5 distros to choose from". CNet. Retrieved 7 September 2016. ^ "Acer announces convertible Chromebook R13, first MediaTek powered Chromebook". 9to5Google. 2016-08-31. Retrieved 2018-03-12. This page was last edited on 2 January 2019, at 07:59 (UTC).